This condition occurs when people do not produce enough tears or when the tears that are produced are not of the proper quality to keep the eye lubricated and comfortable. Who is affected by dry eye? Millions of people worldwide are affected by dry eye. It can affect people of any age or gender but it is more common in older age groups; about 15% of persons over 65 years old have symptoms of dry eye. Women tend to be affected more often after menopause and symptoms may worsen with estrogen replacement therapy. The symptoms of a dry eye occur when the ocular surface is not properly lubricated. Symptoms include burning, stinging and foreign body sensation. What can cause dry eye or make it worse? Medications such as diuretics (water pills), antihistamines, anticholinergics, sleeping pills and antidepressants can cause dry eyes by reducing tear production. In addition, dry eye may be aggravated by reduced humidity, by increased evaporation from wind, air conditioning or heating, or by irritants such as pollen or cigarette smoke. Can persons with dry eye wear contact lenses? Successful contact lens use is dependent on an adequate tear film. A person with mild dry eye who wears contact lenses may require frequent installation of artificial tears or may be forced to reduce contact lens wearing time. More severe cases may require discontinuation of contact lenses, making glasses or Refractive Surgery a better alternative for vision correction. Treatment of dry eye has the common goal of increasing the quantity or quality of tears to augment the tear film thus better protecting the eye surface. Readily available over-the-counter artificial tear replacements offer most patients temporary relief of symptoms when administered throughout the day. If necessary, lubricating ointments may applied at bedtime. More severe cases may be treated with a minor in-office procedure either by reversibly closing the drainage system of the eyelids (puncta) with punctual plugs, or by permanent closure using cautery. 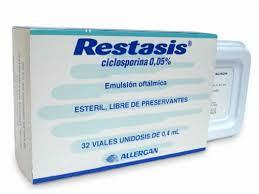 Restasis (cyclosporine 0.05%) is the first prescription eye drop medication indicated for the treatment of dry eye disease. Dry eye has been shown to be more than merely a reduced capacity to produce tears. Recent studies have revealed that ocular surface inflammation plays a central role in this condition. The result of such inflammation is both reduced tear production and poor tear quality, which leads to symptoms of dryness, burning, and irritation. Restasis works by preventing the chronic and often progressive inflammation of dry eye disease, thus restoring a better lubricated and healthier ocular surface. Autologous Serum Eye Drops (Blood/SerumTears) are used as an alternative or in addition to other treatments for patients with severe dryness, burning and irritation. Serum is the fluid component of the patient’s blood which remains after clotting. The autologous serum eye drops are specially prepared for each patient by a pharmacy. All the good things present in a patient’s own tears that are thought to be beneficial are also present in serum. Therefore, autologous serum eye drops are the ideal tear substitute in that they not only provide lubrication, but they naturally control ocular surface inflammation and help promote a healthy corneal surface using the patient’s own body. This is especially true in complicated dry eye patients with systemic disease and persistent corneal healing problems. Each patient must be individually evaluated to determine which of the treatment options would provide the best results. 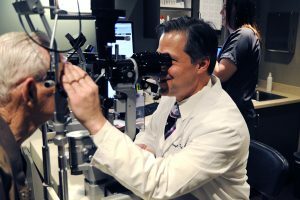 As a Corneal and External Disease Specialist, Dr. Erdey and Dr.Searcy, have made the treatment of Dry Eye a substantial part of their work.